Discussion in 'Announcements & Open Forum' started by Redbeard U812, Sep 12, 2018. A massive hole has opened up in the Sun’s corona, which means we’re officially on watch for a geomagnetic storm. Auroras will be likely across much of North America as the sun heads into a solar minimum. The National Oceanic and Atmospheric Administration (NOAA) has issued a storm watch for a G2-level solar storm on September 11. That’s a moderate storm on the 5-level scale, with G5 being the highest, according to Science Alert. We’re currently heading into a solar minimum, the least active period of the Sun’s 11-year cycle. That means there will be a much lower sunspot, coronal mass ejection, and solar flare activity. If you are one of those who loves seeing the aurora borealis or the “Northern Lights,” have your camera handy, because it could be a beautiful show. As the holes open up in the Sun’s corona, although these are cooler, less dense regions of plasma in the Sun’s atmosphere, they are also more dramatic with open magnetic fields. These open regions allow the solar winds to escape the Sun’s surface more easily, blowing electromagnetic radiation into space at high speeds. If Earth is in the way of those solar winds, we could experience some intense outcomes. While the effects of this wind will be slightly stronger than those of a G1 storm, according to Science Alert, they’ll probably pass most of us by. High-latitude power systems may experience voltage alarms due to surges from geomagnetically induced currents, and longer storms can cause transformer damage, but it looks like this storm will be a relatively short one. According to the British Met Office, the solar winds could travel at speeds of up to 600 kilometers per second (372 miles per second) in the next two days. The biggest effect will probably be the light show since the solar winds are responsible for auroras. As they blow in from space, they interact with charged particles (mainly protons and electrons) in our magnetosphere. 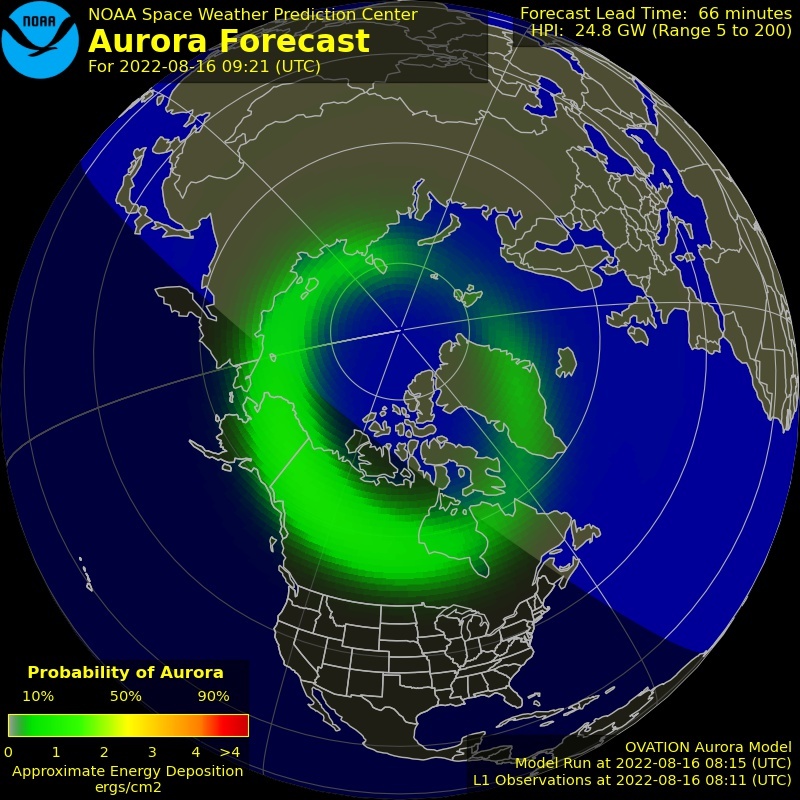 According to a map released by NOAA, the auroras resulting from this storm will likely be visible from Alaska, as well as the states across the United States’s Northern border with Canada and as far south as Iowa and Illinois. There will also be aurora australis visible from Antarctica. 357magnum, Shadetree Mechanic, Captain Kilowatt and 1 other person like this. When Kp index goes to 3 - you'll start to deal with some skip because the Maximum Useable Frequency is starting to climb closer to the 11 meter (27MHz) band. That's good for me. I'm just a CB tote'n Redneck. Only problem is tilted antenna down to modify the base and do some adjustments. We have that storm that just jumped into the Gulf with a 70% chance of formation into a tropical depression. Was same thing last year before Harvey hit Rockport, TX. Solar flares and CME's are NOT a radio operators friend unless you are active on VHF/UHF multimodes.I have been on the air on HF before when a CME (coronal mass ejection) swept past Earth. Really eerie to hear 59++ signals and a crowded band fade out to nearly nothing in a matter of a minute or two. Only a very few of the strongest signals could be heard and they were quite weak at the time.